The Maloney Method » Book Review: Teaching Children With Autism, an ABA Primer by Reg Reynolds, Ph.D.
As the field of psychology widens and deepens its attempts to provide information and treatment regimes for children with autism, there has been a plethora of books published recently. No doubt there will be many more in the coming months and years. Amazon currently lists approximately 750 titles on autism. Selecting from this array and skimming them for any kind of strategies that are solidly based on evidence that can be replicated, is too large a task for any parent or therapist. As behavioural professionals, we should assist parents and therapists by bringing to their attention any book or any author who has tapped into proven methods to assist families and other professionals. Teaching Children with Autism, An ABA Primer by Dr. Reg Reynolds first book falls into the category of needing to be shared. Teaching Children with Autism is about as straightforward as its title. It is written in plain English and systematically walks the reader through a number of concepts and applications that any parent could easily grasp. It also consistently directs the reader to other good sources of information on specific topics. Teaching Children with Autism lists many of the ideas, practices, and situations in which parents and therapists of autistic children will likely find themselves. Each concept or activity is outlined in clear, concise terms often with a reference for further information. In a world where there is such diversity among the various levels, behaviours, capabilities and expectations of a child on the autism spectrum, there is a huge demand for clearly defined approaches. Parents and therapists need direction to select options for treatment that have been demonstrated to be effective. They need tools that have stood the test of scrutiny in research and in the field. They do not need pseudoscience or unproven claims. Dr. Reynolds directs us to many clearly proven choices in a simple direct fashion. If you were only allowed to choose one beginning book about autism, this would be an excellent choice. It should be mandatory reading for every parent,therapist and supervisor in the field.
. 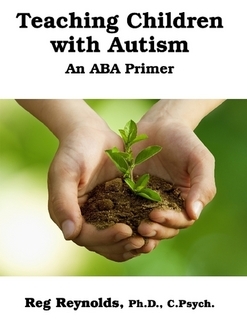 Teaching Children with Autism, An ABA Primer (2013)by Dr. Reg Reynolds is published by Lulu Enterprises (ISBN 978-1-300-74618-8) and is available for $12.95 on their website, www.lulu.com.